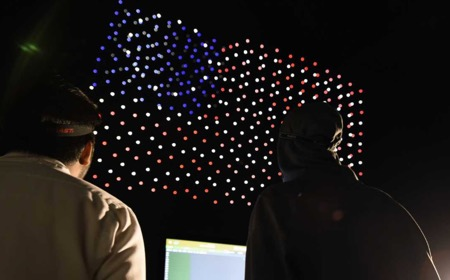 Could drones replace July 4th fireworks in western towns worried about wildfires. At Flashpoint Fireworks we believe there is definitely scope for this idea. We have provided a lot of Lower Noise firework displays this year as noise has become a bigger issue with firework displays over the past few years in the UK. In the video below you can witness the warrior princess take flight in a dazzling drone light show above the LA skyline. With help from 300 Intel® Shooting Star™ drones, Intel and Warner Bros. celebrated the Wonder Woman home entertainment release with a night to remember.